Age of participants from 6 years and determined by the date 01.10.2016. Medal and diploma for the 2nd and 3rd place. 18+ years - open category. - 16+ years (male and female separately). - Cadets 14-15 years, Juniors 16-17 years, Seniors 18+ (on one athlete of the age). –children before 13 years old – 1,5 min. For children before 13 years old - UKF rules. 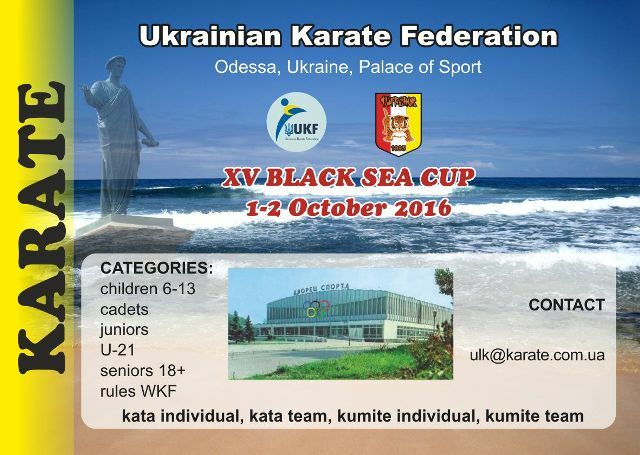 Kata WKF rules 9.0, for children before 13 years old - UKF rules. Competitor can act in the senior age and weight categories.